The source of the cosmic squall is a supermassive black hole buried at the center of the galaxy, officially known as SDSS 1430+1339. As matter in the central regions of the galaxy is pulled toward the black hole, it is energized by the strong gravity and magnetic fields near the black hole. The infalling material produces more radiation than all the stars in the host galaxy. This kind of actively growing black hole is known as a quasar. Located about 1.1 billion light years from Earth, the Teacup's host galaxy was originally discovered in visible light images by citizen scientists in 2007 as part of the Galaxy Zoo project, using data from the Sloan Digital Sky Survey. Since then, professional astronomers using space-based telescopes have gathered clues about the history of this galaxy with an eye toward forecasting how stormy it will be in the future. This new composite image contains X-ray data from Chandra (blue) along with an optical view from NASA's Hubble Space Telescope (red and green). The "handle" of the Teacup is a ring of optical and X-ray light surrounding a giant bubble. This handle-shaped feature, which is located about 30,000 light-years from the supermassive black hole, was likely formed by one or more eruptions powered by the black hole. Radio emission — shown in a separate composite image with the optical data — also outlines this bubble, and a bubble about the same size on the other side of the black hole. Previously, optical telescope observations showed that atoms in the handle of the Teacup were ionized, that is, these particles became charged when some of their electrons were stripped off, presumably by the quasar's strong radiation in the past. The amount of radiation required to ionize the atoms was compared with that inferred from optical observations of the quasar. This comparison suggested that the quasar's radiation production had diminished by a factor of somewhere between 50 and 600 over the last 40,000 to 100,000 years. This inferred sharp decline led researchers to conclude that the quasar in the Teacup was fading or dying. New data from Chandra and ESA's XMM-Newton mission are giving astronomers an improved understanding of the history of this galactic storm. The X-ray spectra (that is, the amount of X-rays over a range of energies) show that the quasar is heavily obscured by gas. This implies that the quasar is producing much more ionizing radiation than indicated by the estimates based on the optical data alone, and that rumors of the quasar's death may have been exaggerated. Instead the quasar has dimmed by only a factor of 25 or less over the past 100,000 years. The Chandra data also show evidence for hotter gas within the bubble, which may imply that a wind of material is blowing away from the black hole. 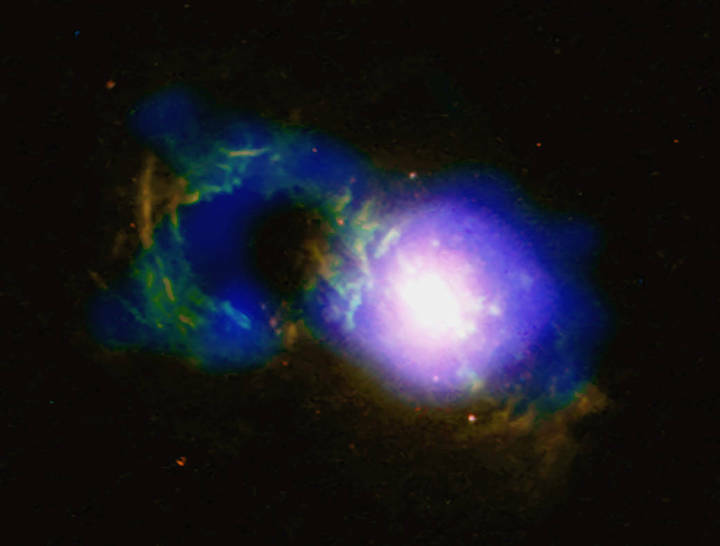 Such a wind, which was driven by radiation from the quasar, may have created the bubbles found in the Teacup. Astronomers have previously observed bubbles of various sizes in elliptical galaxies, galaxy groups and galaxy clusters that were generated by narrow jets containing particles traveling near the speed of light, that shoot away from the supermassive black holes. The energy of the jets dominates the power output of these black holes, rather than radiation. In these jet-driven systems, astronomers have found that the power required to generate the bubbles is proportional to their X-ray brightness. Surprisingly, the radiation-driven Teacup quasar follows this pattern. This suggests radiation-dominated quasar systems and their jet-dominated cousins can have similar effects on their galactic surroundings. A study describing these results was published in the March 20, 2018 issue of The Astrophysical Journal Letters and is available online. The authors are George Lansbury from the University of Cambridge in Cambridge, UK; Miranda E. Jarvis from the Max-Planck Institut für Astrophysik in Garching, Germany; Chris M. Harrison from the European Southern Observatory in Garching, Germany; David M. Alexander from Durham University in Durham, UK; Agnese Del Moro from the Max-Planck-Institut für Extraterrestrische Physik in Garching, Germany; Alastair Edge from Durham University in Durham, UK; James R. Mullaney from The University of Sheffield in Sheffield, UK and Alasdair Thomson from the University of Manchester, Manchester, UK. Image Credit: NASA/CXC/Univ. of Cambridge/G. Lansbury et al; Optical: NASA/STScI/W. Keel et al.